It’s that time again and our next release of Toad for Oracle is right around the corner! GA date is July 13th, so look out for the announcements! For a product that’s so jam packed full of features, people are constantly surprised that we manage to keep coming up with new stuff. The reality is that we are always realigning the product roadmap according to changing market dynamics and customer goals to ensure we continue to meet and exceed end-user expectations. Our main theme last year was to help our customers make the transition from traditional, manual Oracle database development to more agile, automated development leveraging Continuous Integration processes and we’ve made significant progress along that road. This year, our primary goal is the same and we’ll be launching a brand new Toad product later in the year which will enable the dream of seamlessly integrating Oracle database development tasks into a Continuous Integration/Deployment build process a reality. I’ll let you know more in due course. We believe we are the only solution in the market that can offer automated PL/SQL regression test execution and static code reviews which can be integrated with CI. In our experience, this is one of the primary roadblocks that development shops faces as they transition to DevOps. Migration to Oracle databases in the cloud is another trend we are seeing so we have a lot of capabilities in support of managing Oracle database in the Oracle Cloud Service as well as working with Oracle databases in Amazon AWS and MS Azure. Have a read of these blog articles for more information on how to manage Oracle 12c multi-tenant database in the Oracle Cloud using Toad. To make sure you have a simple, fast way to get your Toad products installed, we’ve incorporated a number of pre-installation checks to help you along the way. Toad’s Team Coding utility enables developers to work directly with PL/SQL and other schema objects in the Editor and simultaneously control the corresponding files in the source control repository using a proprietary version control system such as Subversion, Git or TFS. Team Coding is available with ALL editions of Toad. You now check-in/check-out PL/SQL unit tests using your source control system. For those organisations that are transitioning to agile database development using Continuous Integration, it’s important that, as PL/SQL code changes are made and tested, that unit tests relating to that version of code (which may require new use cases) get checked into source control as well. This enables a configuration to be created in the build process which represents the state of that code at that point-in-time. As the build is promoted into (say) QA, when QA test the code, they have all the test cases available already in source control. Note: In order for this to work correctly, you need to have your Team Coding repository hosted on an Oracle database (not hosted on the Toad Intelligence Central server). When you manage an existing Team Coding Project or create a new Project, make sure you include Unit Tests along with your other objects. 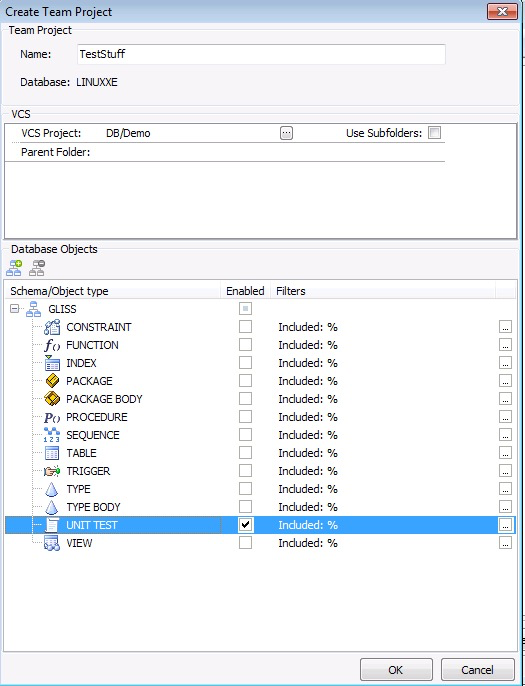 When you create new unit tests, either using Toad’s Editor or using Code Tester for Oracle, you will be presented with the option of checking the unit test into source control. Note: If you are transitioning from using Oracle’s SQL Developer to Toad for Oracle and you’re concerned about any unit tests you may have created, fear not! You can now import unit tests from SQL Developer to Toad. 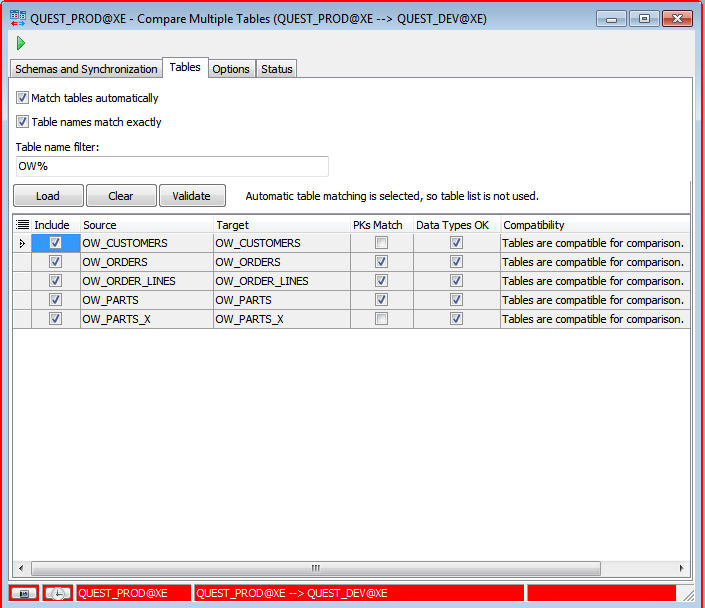 Our Table Compare feature is very popular, but is limited to single table pairs. In this release you can now compare data in tables across 2 entire schemas and generate individual (per object) or combined sync scripts. This capability also provides the potential to be a part of an automated deployment of schema changes into a target database as part of a Continuous Deployment process. Please read this blog written by one of our Toad for Oracle developers for more information on this great new feature. 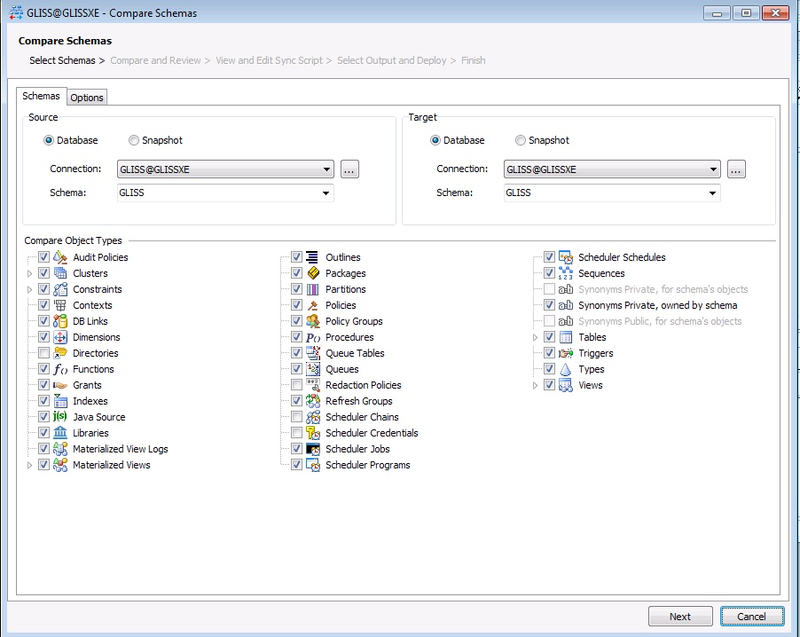 Toad’s Schema Compare is one of the most popular features used by DBAs and developers alike. It is an extremely powerful feature and provides multiple options including the use of snapshots, source control integration and how the sync script is applied. We wanted to make sure this feature continues to be used whilst encouraging new users to try it, whilst maintaining all the power of the existing feature, so we re-wrote it and built a new UI with a simplified, wizard style workflow to help drive it. 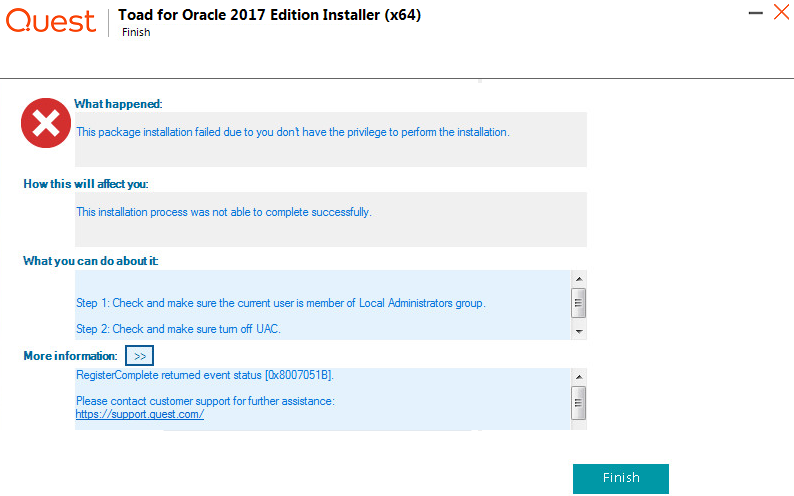 There is also an option to use Oracle’s DBMS_REDEFINITION feature to perform the synchronization in cases where a table drop is not appropriate. E.g. A column added to a table but with the column order changed. When you reach the final step of the wizard, the choice of how you deploy the sync script is much more obvious including checking into source control. Toad World is a hugely valuable resource for Toad users as it provides lots of advice and guidance from recognised experts around the world as well as providing insights into other database platforms. This enhancement complements the Support portal integration we added in 12.10 so you can now benefit from direct access to both major websites. The new Toad World toolbar enables a much more visible way to harness all these great benefits by simplifying Toad World registration and getting access to Toad forums, ask questions to thousands of other Toad users. Cloud database support – Pluggable databases can now be cloned from one server to another via a DB Link instead of having to manually copy file. Automation Designer Query Iterator – based on the result set for a query, you can perform a child action for each row. E.g. select a list of tables then run an action against each table. Oracle Database v8.x and v9.x – Oracle’s extended support ended in 2006 and 2010 respectively so we will cease regression testing on these versions. Toad for Oracle will, however, continue to work as before. Execution of Toad automations on Toad Intelligence Central – with the release of our new Toad DevOps solution later in the year, we have decided to deprecate the publishing and execution of Actions and Apps on Toad Intelligence Central. Other files and data (such as code reviews and unit tests) can continue to be published as before and Toad’s Team Coding repository can still be hosted here. There will be a new Technical Brief on Toad for Oracle 2017 published shortly which will be available on http://www.quest.com/toad-for-oracle/ so watch this space!